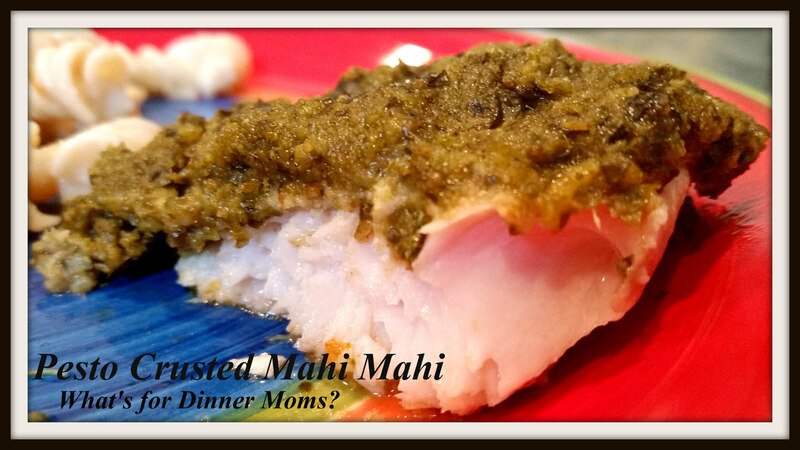 Pesto Crusted Mahi Mahi – What's for Dinner Moms? We have been traveling so much lately I am trying to clean out the freezer a bit rather than buy more groceries. We had two pounds of Mahi Mahi to use and as I searched the pantry I came across a jar of basil pesto and a jar of sun-dried tomato-basil pesto. Perfect! This turned out better than we thought. Everyone really liked both the regular pesto and the sun-dried tomato-basil pesto but the sun-dried tomato-basil pesto was the favorite overall. Tip: The trick with the pesto is to add enough bread crumbs to make if firm but not too dry or not enough so that it is too liquid. You want it firm but not dry. Adjust the bread crumbs in the recipe to work with your pesto. Serve with a vegetable and green salad for a delicious and simple meal! If fish is frozen thaw in refrigerator and then pat dry. Preheat oven to 425 degrees. Salt and pepper both sides of the fish. Place fish on baking sheet. Place 1/2 cup of bread crumbs (more or less per tip above) in a bowl with one of the pesto. Mix well. Press mixture onto top of 1/2 of the fish pieces. Repeat step 3 with second pesto. Bake 12-15 minutes until fish is cooked through. Fish will be flaky and opaque. Cooking time may vary on the thickness of your fish. I just love your blog and your interesting recipe. As a blogger I am always looking for new ideas and after reading your rules of no repeat recipes I thought you might enjoy the follow recipe from my Twisted Sister blog: https://blingbeadedbaubles.com/blogs/the-twist-from-a-twisted-sister/mangia-motifs-read-if-you-need-a-giggle. Let me know and all the best! Thank you! Love the post! That’s what I love taking something and making it work for you! Thank you, Lynn! Hope all is well with you and your family.